If you follow me in Instagram (don’t tell me you don’t! @watchmesee) you know how much I love sharing not only my own photo updates from my travels and life in Glasgow, I also love to give a shout out to some of my favourite travel bloggers and adventurers out there. I get much of my inspiration for travelling around Scotland from Instagram, especially when it comes new peaks to climb, national parks to explore or lochs to kayak. Here are some of my favourite Scottish adventurers of Instagram who keep sharing their best adventure moments with us every day. Ellis O’Connor is a Scottish artist and photographer and if you follow her on Instagram be reassured that she will take you to the most remote places around the country. The mountains and the sea are never far in her snapshots and every now and then she shares her artwork inspired by the incredible Scottish landscape with us. James Irvine is one of those people whose photo I admire so much, but could never imagine to go on the same kind of adventures. We’re speaking surfing in Shetland here and a) I’m terrible on a surfboard and b) do you know how cold that water is?! James also skateboards, skies, mountain bikes, climbs and does all other sorts of crazy outdoor sports. Steve Oates is part of a collective of photographers sharing their love for the Scottish mountains called The Highland Collective. His personal feed is very much like what you’d expect it to look like – loads of mountain ranges, hiking adventures and ‘bearded man on mountain’-poses! Jason is based in Edinburgh but is far from sticking to the streets of the town – he constantly heads out into the Highlands and other gorgeous sceneries all over Scotland and shares his best hiking pics with us day after day. His two main photo subjects are the Scottish hills and his partner Kirsty, who by the way has a pretty rad Instagram account herself! Katrina is pursuing an adventure of her own kind – whenever the Scottish Highlands or islands call, she and her family jump into their lime green Volkswagen bus and hit the road. When she’s not sharing her best photos on Instagram she blogs about her trips on her website – you won’t need more than that to make you want to visit Scotland! 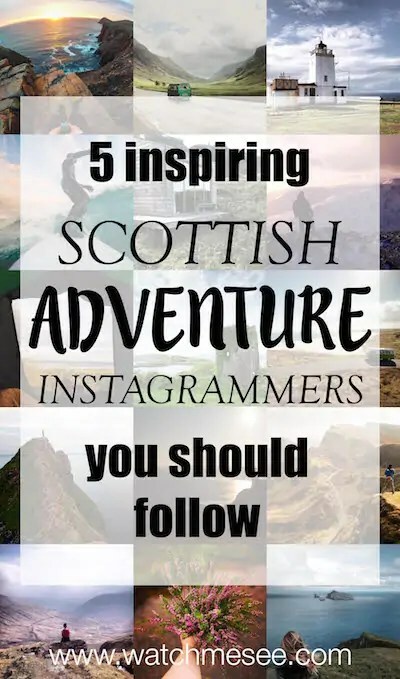 I don’t need a couple of photographers to convince me that Scotland is an adventurously beautiful country, but these are five accounts that I love to follow for inspiration for my own upcoming trips. Do you know of any other Scottish adventure Instagrammers that I should check out? Oh I’ve just come across this. Thanks for the mention. Happy to hear I’m inspiring people to visit Scotland. It’s a beautiful country. Oh, you’re very welcome! Thanks for your inspiring photos! These pictures are really amazing. I am wonder is it really exist. Aw these pictures make me want to go back to Scotland! You should come back then 🙂 Thanks for your comment!